Anthony Trollope’s fortieth novel, concerns a respectable Christian boys’ school whose proprietor unknowingly hires a woman who apparently has two husbands: A devoted English scholar and an abusive drunkard from the American south. The book interweaves a sensitive and realistic exploration of Dr. Wortle’s moral dilemma with a humorous look at small-town gossip and--of course--a romance involving the doctor’s beautiful young daughter. A really great read, great themes, wonderful characterisation - so exciting, so dramatic, so moving and engaging. A great Trollope novel and a great place to start with his work. 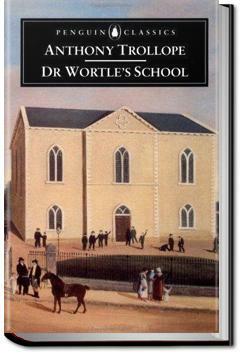 To call anything written by Trollope "minor" is to commit a great sacrilege; however, Dr. Wortle's School, while written late in Trollope's life—and published the year preceding his death—is far from the range, breadth, and scope that one associates with Trollope's work.